Today's Love Thursday is more of a list. I just don't have enough of one thing today and really my brain has been working on an entirely different type of entry that doesn't fit into a Love Thursday or Thankful Friday category. You'll just have to have patience for that entry. The AIDS Walk Open helped to strengthen my determination to participate in the KCMO AIDS Walk. The guys I spent my Saturday with work so hard on the AIDS Walk in general. They are my inspiration. In fact, this may end up being my project for the next two months. I have signed up to donate $10 a month to Donors Choose, but have not decided on a specific project yet. The AIDS Walk has always been my thing, my charity. So I went over to set up a donation page and realized that I already had one for OKC AIDS Walk. I had no idea I'd raised $320 for the AIDS Walk that year. Go me! So, for the next two months I will be reminding people to get over to my AIDS Walk KCMO donation page to give some money to a great cause (I'm still trying to figure out how to add the widget to the blog--Todd?). Tuesday night I pulled into my driveway to see that someone had brought my recycle bin up from the curb. This may sound like a very small act of kindness but it really meant the world to me. I have a long driveway and at the end of the day when I'm extra tired, the driveway can be twice as long as usual. Tuesday was also frighteningly cold, with blustering twenty-five miles per hour winds. There's still about a foot and half of snow still sitting on my yard. So retrieving the recycle bin was pretty much at the top of the list of things I did not want to do. Seeing that recycle bin already sitting next to my front steps just made everything lighter. 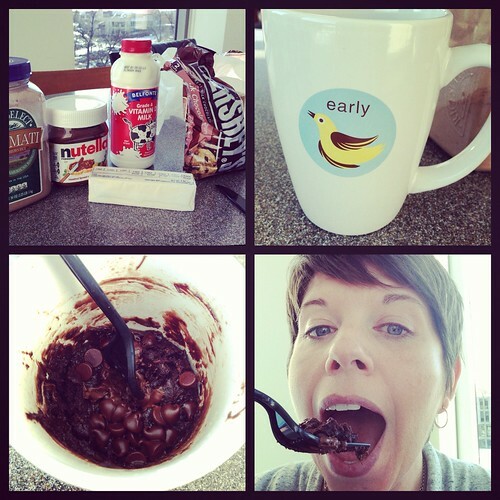 Wednesday, Sean brought all the ingredients required to make a brownie in a mug. A few of us gathered in the break room after lunch and made brownies. They were delicious and came at the perfect time of the day. It made everything about Wednesday better. We used this recipe and Nutella instead of almond butter. Do this! It will make everything better.